Republicans' seven-year quest to wipe out President Obama's Affordable Care Act came to a crashing halt around 1:30 this morning, when Sen. John McCain (R-Ariz.) shockingly bucked his party and voted against a scaled-down repeal bill that emerged as the Senate's last-ditch effort. It's now clear that replacing Obamacare -- or even repealing small parts of it -- may be forever a pipe dream for President Trump and the GOP, whose deep divisions over the U.S. health-care system proved unbridgeable in the end. So great that John McCain is coming back to vote. Brave - American hero! Thank you John. While the health-care debate will never really be over -- and lawmakers are still under pressure to respond to some Obamacare marketplace ills -- Republicans appear to have landed at a dead end on their top legislative priority six months into Trump's presidency. "This is a disappointment, this is a disappointment indeed," McConnell said. "I regret our efforts were simply not enough this time." "What we tried to accomplish for the American people was the right thing for the country and our only regret tonight is that we didn't achieve what we had hoped to accomplish," he added. "It’s time to move on." But if McConnell's chief aim was to show he'd tried his darndest to pass an Obamacare repeal bill, that is something the leader appears to have accomplished. The week started out painfully and turned excruciating, as Senate Republicans took up and then rejected multiple iterations of ACA rollback plans. First, they barely managed to start debate. Then they failed to pass a repeal-replace bill that was McConnell's brainchild. Then, they failed to pass a repeal-only bill. Just when McConnell thought he had scraped the votes together for his "skinny repeal" measure, McCain revolted. While viewed as the only bill that could possibly unite the GOP's hard-line conservatives and pragmatic moderates, that final "skinny" bill faced strong resistance from all corners, similar to its beefier siblings. Insurers hated it because it repealed the law's individual mandate to buy coverage while still requiring them to offer generous benefits and accept all comers regardless of their health status. Conservatives didn't like the fact it repealed only small parts of Obamacare and would drive up premiums. Moderates charged that "skinny repeal" wouldn't improve, and could even worsen, the marketplaces, where premiums are rising and insurers are withdrawing. McCain had also repeatedly criticized McConnell for skipping public hearings and input from Democrats while crafting health-care legislation. Republicans shouldn't make the same mistakes as Democrats in 2010 when crafting and passing the ACA without any GOP support, he said. “We should not make the mistakes of the past that has led to Obamacare’s collapse," McCain said. "We must now return to the correct way of legislating and send the bill back to committee, hold hearings, receive input from both sides of aisle, heed the recommendations of nation’s governors, and produce a bill that finally delivers affordable health care for the American people." Besides repealing the individual mandate, "skinny repeal" would have also suspended for eight years the ACA's employer mandate to offer coverage and repealed just one of its taxes, the medical device tax. Additionally, it would have raised the contribution limit for tax-free health savings accounts, extended some more latitude through waivers in how states could run their marketplaces and blocked Medicaid funds from Planned Parenthood clinics for one year. But its repeal of the individual mandate would have had the biggest effect on insurance coverage. The Congressional Budget Office estimated it would result in 15 million fewer Americans insured within a few years and a 20 percent average increase in premiums. Republicans weren't ignorant of those outcomes. That's why the whole effort nearly folded even before the final vote, when McCain, Lindsay Graham of South Carolina and Ron Johnson of Wisconsin refused early Thursday evening to vote for the measure without a promise that the House wouldn't pass it. House Speaker Paul D. Ryan ultimately won Graham and Johson over, after issuing a measured statement expressing openness to a House-Senate conference where the bill could be rewritten. But McCain wouldn't budge. Of course, Ryan no longer has to follow through on the that promise since the Senate has failed to pass a health-care bill at all. "Journalists had fanned out around the Capitol, searching for the Arizona senator, a man they believed controlled the fate of the so-called 'skinny repeal' bill. The fact that Papa John’s pizza had been delivered to his Russell building office was a good sign he was in there somewhere, but the cleaning crew that kept popping in and out was a sign that maybe he wasn’t," Ben writes. "The clock struck midnight, and out he came. The hero or the villain, depending on which side you were on, and neither side knew which yet." "Have you decided how you'll vote?" press corps. McCain has now stepped out. On his way out, Klobuchar put her hands on McCain's shoulders and they hugged. Once McConnell started the voting on "skinny repeal. ", things moved pretty quickly. Here's the climactic moment when McCain voted "no:"
Schumer on McCain: "He's a hero. He's a hero of mine." What a remarkable moment it would be if a war hero, fighting cancer, returned to the Senate to say "this is wrong, America must be better." Thune, Blunt, Tillis, and Sullivan are working Murkowski. Murkowski might be the weakest link here. As Schumer praised McCain, Klobuchar interjected: "And can we also not forgot the two women senators who were there from the beginning." At midnight it will be the 52 years TO THE DAY since the Senate passed Medicare and Medicaid. On a day we should be celebrating Medicare/Medicaid's 52nd anniversary, the @SenateGOP will vote to take health care away from millions. --Vice President Pence, who was in and out of the Senate chamber throughout the night, gave perhaps the best hint the whole thing was about to go down in flames. When the voting started, he wasn't presiding at the dais, where he'd need to be to cast a tie-breaking vote. Pence is NOT in the chair. Source tells me the White House called for Pence. They couldn't get Pence off the floor. The White House hung up. i'm told at one point Pres. Trump spoke to McCain when McCain was huddling w/ Pence before the vote. Last minute effort didn't work. --What's next for Republicans and health care? I laid out a list of issues they're going to have to deal with in the coming months, from whether to fund extra Obamacare cost-sharing subsidies to how to convince more insurers to participate in the marketplaces to whether to enforce the individual mandate.
.@SenJohnMcCain has endured far more in his life that the pressure he came under tonight. But what a courageous vote! Thank you my old friend. --Of several amendments the Senate voted on yesterday, members did approve 52-48 a measure offered by Nevada Republican Dean Heller to repeal the "Cadillac tax." The 40 percent excise tax on high-cost health plans -- designed to discourage employers from offering extremely cushy benefits that can drive up health spending -- was included in the ACA. But it had previously been delayed by Congress and was scheduled to take effect in 2020. Of course, it's moot now that the underlying bill has failed. --Earlier in the day, the Senate rejected a single-payer amendment introduced by Republican Sen. Steve Daines of Montana, which was designed to test vulnerable Democrats on whether they would vote for the controversial idea. Indeed, four red-state Democrats -- Sens. Heidi Heitkamp of North Dakota, Joe Manchin III of West Virginia, Sen. Joe Donnelly of Indiana and Jon Tester of Montana -- and an independent, Angus King of Maine, joined Republicans to oppose it. The rest of the Democrats voted "present" on the amendment, which failed 0-57. My colleague Dave Weigel had reported Wednesday night that Democrats had planned all along to reject the amendment, calling it a "sham." "I suspect that what Sen. Daines is doing is nothing more than an old political trick, trying to embarrass Democrats," Sanders said on the Senate floor yesterday. "But I do hope, by the way, at some point within this debate, if we can — if not, certainly in the near future — to in fact be introducing a Medicare-for-all, single-payer program," Sanders added. "It will be somewhat different than my friend John Conyers Jr.' bill in the House, but what it will do is say that in America, if you are rich or if you are poor, if you are a man, woman, and child, yes, you are entitled to health care as a human right and not a privilege." 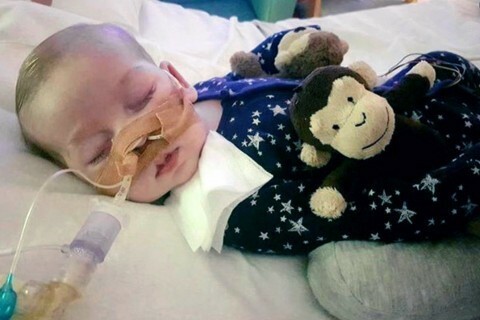 Sanders says Democrats will vote present on the legislation since Daines put it up as a "political trick"
The court-mandated deadline to agree on Charlie Gard's hospice care has passed. Lindsey Bever and Cleve R. Wootson Jr. The war in Congress over repealing and replacing the Affordable Care Act has brought anxiety to the people whose health insurance is at risk. 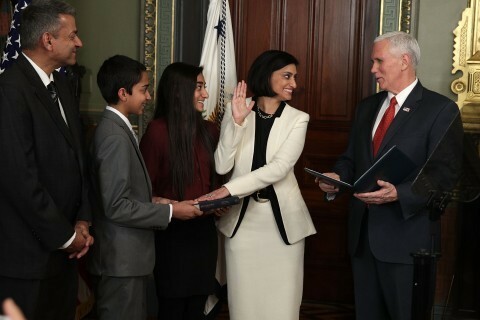 Seema Verma Runs Medicaid. Her Husband’s Practice Won’t Accept It. Dr. Sanjay Mishra, the husband of CMS Administrator Seema Verma, is part of a group practice in Indiana that does not accept Medicaid payments. A health-care rally is planned for Saturday in Washington, D.C.
Brookings Institution is holding an event on "Procedure and politics in the 115th Congress" on August 2.